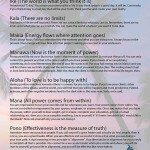 Lomi lomi is based on seven sacred Hawaiian principles. If you would like a copy of these you can download the seven sacred principle list here. See our Lomi Lomi massage training DVD available for sale at our spas if you would like to learn this beautiful form of Hawaiian bodywork.